Well tarred roads along endless coastlines, sunset cruises off the blue waters of the Atlantic, green fields dotted with gold and home to a plethora of animals and birds, these are some of things that endeared me to South Africa, which I visited December last. As you move to the southernmost tip of Africa, the landscape changes dramatically, the pace of life develops a new rhythm, Afrikaans becomes the official language and sunset cruises off the Atlantic become a norm. Punctuated by towering cliffs, endless coastlines and cobalt blue oceans, SA is one of the most sought after tourist destinations in the world. Capetown: Known as the legislative capital of SA, Cape Town ranks second among the most populous areas in SA. With a heady mix of stunning landscapes, towering buildings and breathtaking views of the Atlantic, Cape Town proudly stands apart from the rest of the country. Having checked into the hotel in the late afternoons, our first pit stop was Victoria & Alfred Waterfront. Set against a backdrop of magnificent sea and mountainous views, V&A waterfront has become SA’s most visited destination. It is an epicurean paradise and draws hordes of visitors for its fine dining and shopping, galleries and gift boutiques and impromptu musical happenings. Caressing us, icy cold breeze interspersed with drops of rain almost blew us off our feet as we alighted from our shuttle. It was a perfect spring afternoon as the sea gulls danced on well-manicured lawns soaking the afternoon sun. The locals welcomed us singing chorus. We extended bonhomie, sang along and played the bongo as our music lilted over the faint waves heard across the Atlantic. After spending a couple of hours at the Mall, we chose to retreat in to ‘The Quay Waterfront’ one of the restaurants that almost ran into the sea. Tucked in one corner of the waterfront, it overlooked the sea and had a deck like seating. Sea gulls made a pit stop at almost every table that ordered for fish. Soaking in the ambience, we settled for some fish and chips which was a very delicious opening to the evening . The fish was tender and every bite brought out the oceanic flavours. It was a perfect setting and an entire evening could be sucked away just gazing at the shimmering blue waters peppered with seemingly stationary yachts and sail boats. As the clock ticked 7 and the sun came down, it was time to set off on one of the sunset cruises. The breeze was icy cold, the waters deep blue and the orange hue of the sunset was surreal. Champagne flowed as the ship bobbed up and down the choppy waters of the Atlantic. 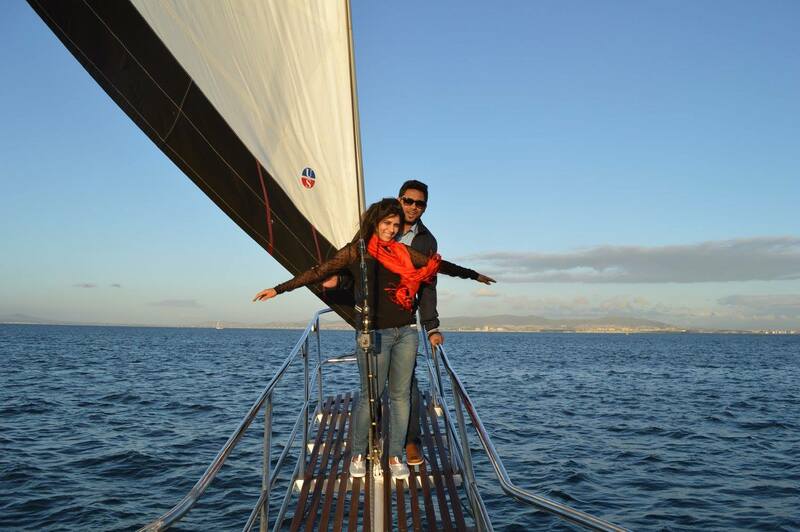 We sailed on for an hour and a half, admiring the stunning landscapes, clicking pictures and posing a la Titanic. Early next morning, we soared up the ‘Table Mountain Cableway’ which took us 3500 feet above sea level to one of the seven natural wonders of the world- ‘the Table Mountain’ and as we went up, the city of Cape Town began to shrink into a toy land. 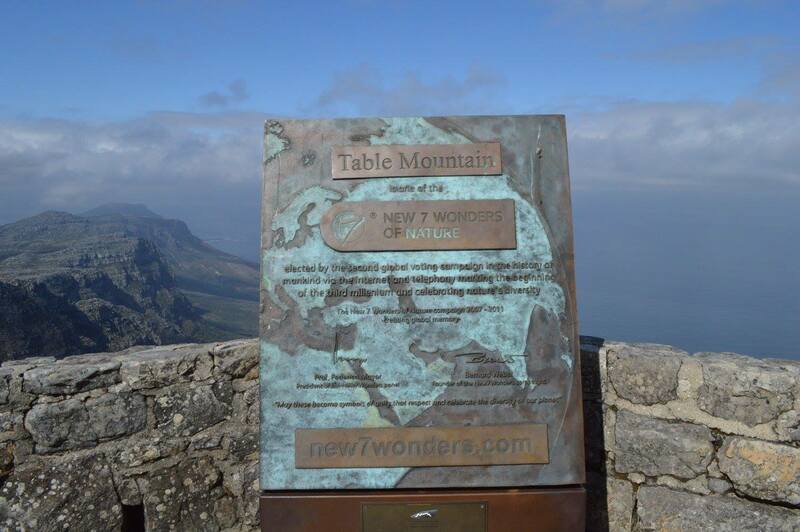 The main feature of Table Mountain is the level plateau, edged by impressive cliffs. The plateau, flanked by Devil’s Peak to the East and by Lion’s Head to the West, forms a dramatic backdrop to Cape Town. This broad sweep of mountainous heights reminded me of the hills in Shimla back home. The vegetation there is mostly from the ‘Proteas family’ which is why the South Africans are also called as ‘Proteas’. The mammal found on the island is a ‘Dassie’ which is generally found basking in the summer sun along the rocks. We descended down ‘Table Mountain’ and made our way to Chapman’s Peak, a mountain in the western side of Cape Peninsula, which is located between Hout Bay and Noordhoek. The blue seas on one side and the mountains on the other made a perfect setting for a picturesque drive. In a meandering stretch of 9 kms and 114 curves of breathtaking scenery, we had to stop our car, breathe and burn this picture postcard in our minds. We drove along ‘Chappies’ for almost an hour. Alas, still couldn’t get enough of this beautiful landscape! Later, we made our way to the scenic coastal town with a lovely swimming beach and a picturesque harbor, ‘Hout’s Bay’. The pretty town lies between Chapman’s Peak and Mount Sentinel. We ferried to the Seal Island which is also known as Duiker Island. It was one of the most beautiful ferry rides ever. The Mountains and the clear blue waters, the setting seemed right out of movies. Thousand of seals lay on the island soaking up the summer sun. We spent a few minutes with the seals, tried feeding them, keeping a safe distance. The wind danced on the waters making the boat ride choppier. Our next stop was Cape of Good Hope. Yes, it was the same point that we had studied about in our history books, to be the southernmost tip of Africa. However, we were surprised to know that Cape Agulhas is the southernmost tip of Africa, which for its navigational hazards, is home to many notable ship wrecks. It is the point where the warm waters of the Indian Ocean meet the cold waters of the Atlantic. Having made our way to this historic mark, we somehow felt drawn closer to Vasco da Gama and the likesJ. 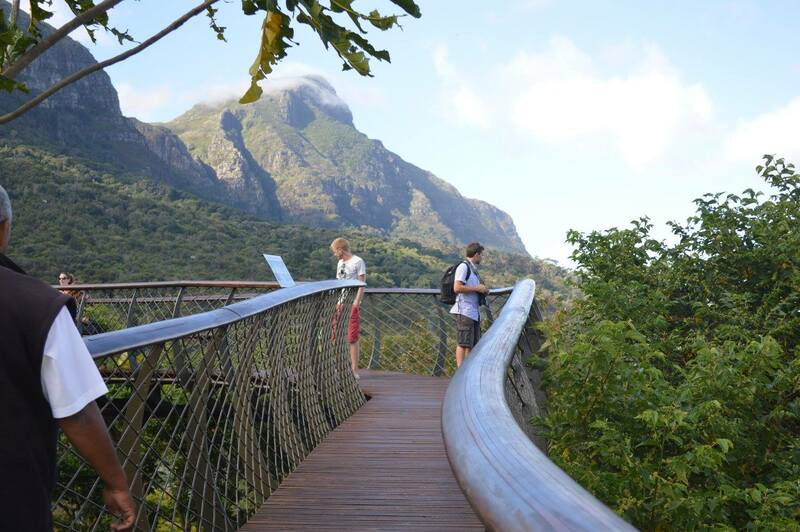 We clocked another beautiful destination – Kirstenbosch National Botanical Garden. Nestled at the bottom of Table Mountain, it is acclaimed as one of the greatest botanical gardens in the world. Acres of well-manicured lawns dotted with lakes, housing rare species of animals and birds and the ‘Canopy Tree Walk’ that meandered through the canopy of trees was absolutely overwhelming. From celebrating birthdays to organizing picnics, the garden was thronged by the young and the old and I am sure each one enjoyed in their own little way. For me, I could just sit there in a sequestered spot all day and admire the beauty of the garden, savouring its salubrious environs. Knysna: We drove past fields of green and gold on well tarred roads that snaked through the mountains and revealed some impressive landscapes that had been preserved for generations. We sat memserised as we drove for 6 hours along endless coastlines soaking in the pristine beauty of the Garden Route. We finally made our way to the sleepy town of Knysna. While in Knysna, we floated down Knysna Lagoon gazing at dreamy riverside villas and admiring the mountains and the dense jungles along Knysna heads. Set against turquoise blue waters of the lagoon, the sky above in contrast, looked orange hue. I was blown away by the mélange of colours. Anybody would. There was very little to do at Knysna other than cruising and dining at one of the umpteen sea food restaurants. Yet the slow pace of life had a hypnotic otherness to it. Oudtshoorn: A truck load of adventure was lined up for us the next day at Oudtshoorn, which was a couple of hours drive from Knysna. 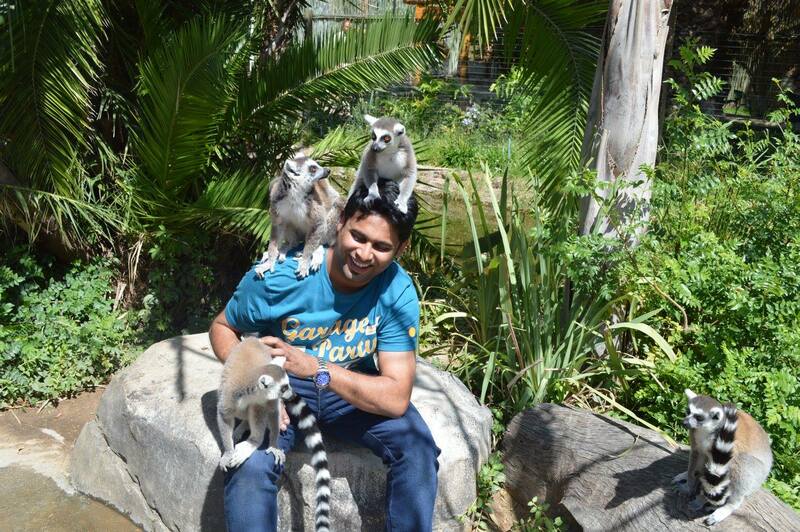 From visiting the Cango caves with its zillion year old stalactites and stalagmites to the live Cheetah encounters at the Cango Wildlife Ranch, Oudtshoorn was packed with adventure to the brim. There were crocodiles, Emus, Wallabies, Porcupines, Lemurs, White Lions, White Bengal Tiger, Leopards most of which I had never watched with my naked eye, so close, before. 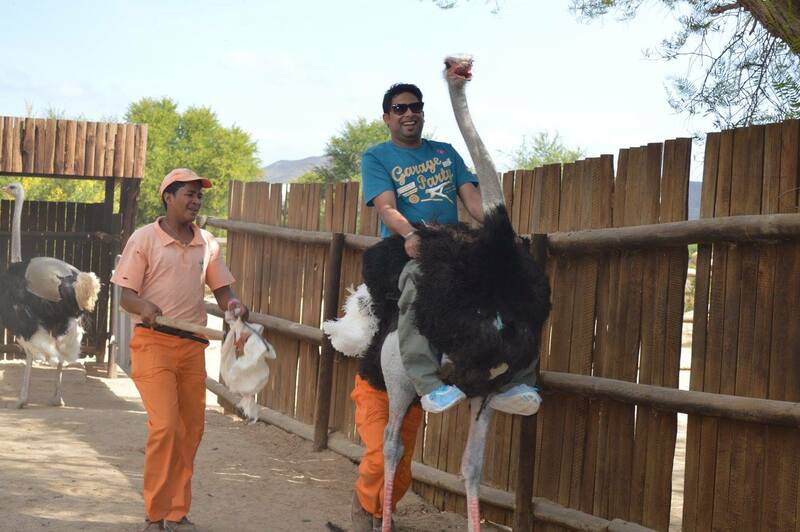 We chose to ride an ostrich which was a dangerously funny ride that lasted for not more than two minutes but sent us into a laughter coma. 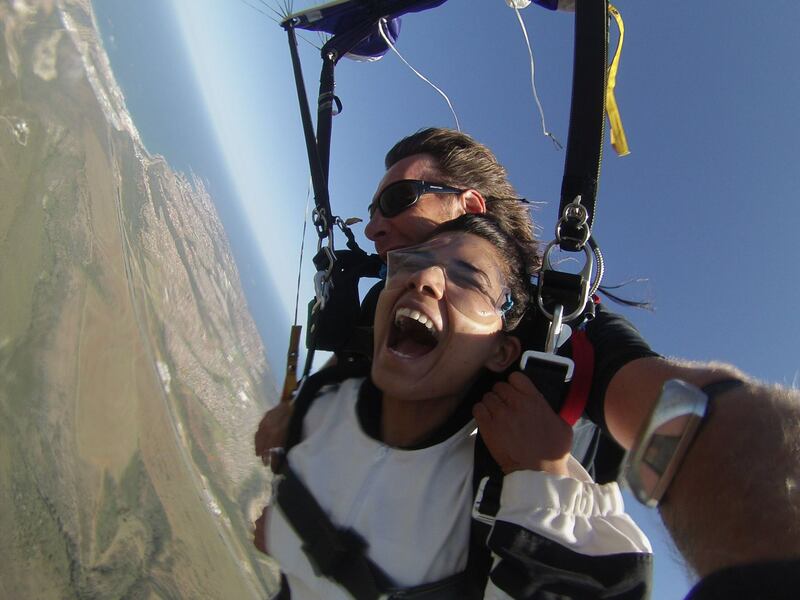 Mossel Bay: Later that afternoon, we skydived from 10000 feet above sea level at Mossel Bay. From a 25 minute ride in an open airplane and witnessing the beautiful African landscape to having butterflies in our stomachs before taking the leap of faith, the sky dive was most definitely the highlight of the trip. Back home, it was fun to watch the recorded version of our jump on laptops. 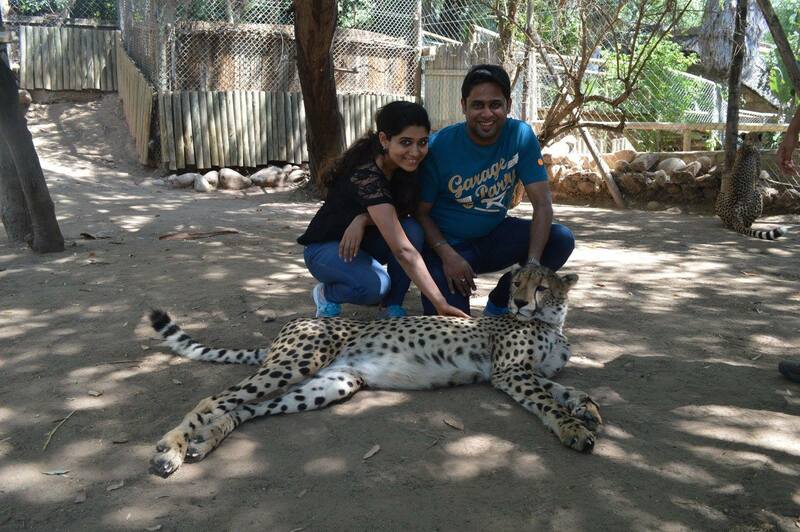 Suncity: After a day of adventure, it was time to relax at Africa’s premium tourist destination, Sun City. The lavish opulence of the hotels, the swanky stores lined up and the glamour of the casinos all made up for an extravagant and indulgent tour. With the tropical thrills of the Valley of the Waves, the zigzag water tube rides, the 6D movie shows and the picturesque dinner date 1000 ft above the ground, Sun City was truly a paradise on earth and epitome of the journey. 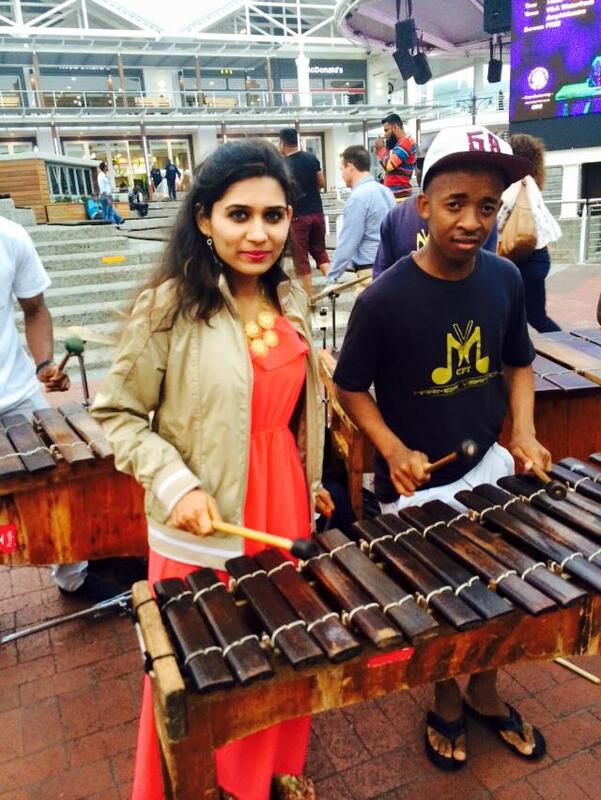 Our trip to South Africa was a cherished one and was more than we could have asked for. 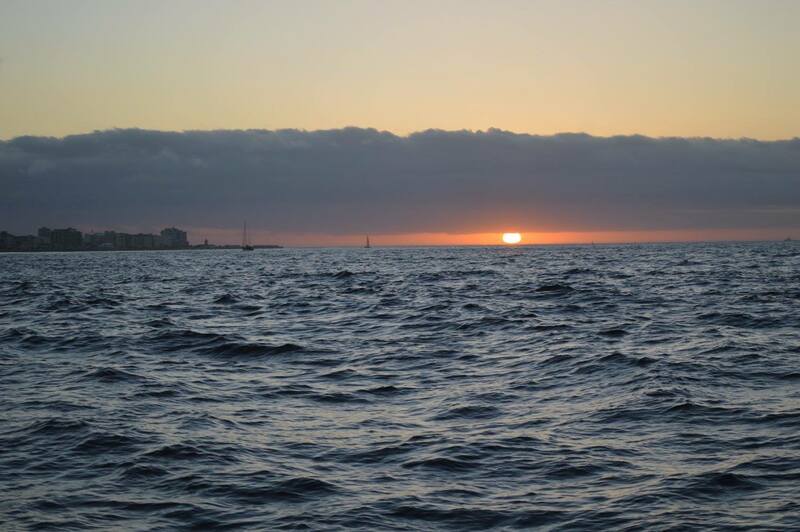 Every time the sun sets over the Indian horizon, I am reminded of the majestic sunsets off the Atlantic that beckons another South African holiday. Visit Moi Palate's profile on Pinterest.